Car accidents are one of the leading causes of childhood deaths in the United States, with thousands more children receiving serious injuries each year. California’s child restraint laws require parents to ensure children are buckled up, but many people aren’t following these rules. ​Current California law requires children under the age of eight to ride in a car seat or booster seat in the back seat of the vehicle. However, children who are eight years of age or are at least 4'9" in height can be secured by a safety belt in the back seat. They may use the vehicle seat belt if it fits with the lap belt resting low on the hips and touching the upper thighs while the shoulder belt is across the center of the child’s chest. If the seat belt does not fit properly, it is recommended that the child remain in a booster seat. Passengers are subject to California's Mandatory Seat Belt law. This law requires everyone to buckle up unless they have a medical disability or are riding in a vehicle that qualifies for an exemption. Effective January 1, 2017, children under the age of two will be required to ride in a rear-facing car seat unless they weigh 40 or more pounds or are 40 or more inches tall. 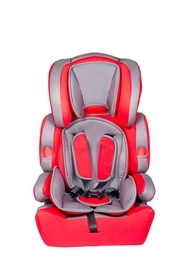 Drivers are required to make sure children are secured in a way that complies with the height and weight limits outlined by the manufacturer of the car seat. The parent was in a hurry to reach their destination and didn't want to take time to secure the child. The parent thought the child would be safe on a short trip. The parent gave into the protests of a child who found the restraints to be uncomfortable. The parent couldn't afford the necessary car seat or booster seat. The parent was driving while under the influence of alcohol or drugs. A child removed the seatbelt on their own. Even among parents who understand the importance of using car seats and booster seats, there remains some confusion about how to properly secure their children. For example, many parents don't pull the straps tight enough when installing a car seat. In the event of a collision, this means the seat will move and the child will be subject to greater crash forces. Keeping the chest clip in the car seat too low is another common error, resulting in a risk of abdominal injuries as the plastic portion of the clip pushes into the child's stomach following a sudden stop or crash. Most new cars have special attachments for car seats and booster seats. If you purchase a new car have the car dealer ship demonstrate for you the special attachments for toady’s newer car seats. These attachments are designed to prevent user error in attaching the child’s car seat to the car. For first time parents, car seat rules can feel a bit overwhelming. However, help is available to keep children safe. Parents or caregivers who have questions about how to properly use a car seat can use the Safer Car website to find a certified technician who will inspect the device free of charge. If a child is seriously injured in an accident caused by a negligent driver, his parents or legal guardians can file a personal injury suit on his behalf. The child is entitled to compensation for medical expenses, loss of future earning potential, and pain and suffering. Parents or legal guardians can pursue a wrongful death claim if they've lost a child in an auto accident. Compensation in this type of case is similar to a personal injury claim, with the addition of reimbursement for funeral and burial costs. The legal team at Inland Empire Law Group has extensive experience assisting California parents in obtaining compensation after a child has been injured in an auto accident. Please call (888) MY IE LAW to schedule a free, no-obligation consultation at either our Rancho Cucamonga or Victorville offices.